Dearth means “shortage or lack of something” and in the case of bees, it means lack of nectar. This year is extremely dry in California, which means the natural nectar flow stopped earlier that usual. Feeding my hives is creating a “simulated” nectar flow , and since my colonies are “preemies” they need extra help to make sure they have enough food to survive the winter. Technically, my bees are not experiencing this year’s early dearth because I’ve been feeding them. I’ve heard that nice bees can turn into mean bees during dearth. I can say that’s 100% true for my Cosmo colony! Cosmo is the colony that started from the nuc, you can read about that here. They arrived about 30 days later than expected, and that meant I had to be extra “on it” about feeding them. Little did I know that hungry bees = mean bees. It took me about two weeks to realize my homemade quart size mason jar “feeder” was not working for that colony. That’s at least “newbee” mistake number 10 for me! A week after adding the quart size feeder, they’d barely eaten the syrup, which was strange since most new colonies eat about a quart a day. Initially, I thought they’d found nectar flow some where else. I got clear confirmation that WAS NOT the case during my July 5th hive check, because those bees were MEAN! They were very loud, several buzzed around my head, and when I tried to check the bottom super, it seemed like a mini swarm was flying around me! I realized my risk of getting stung was increasing by the second, so I decided to close the hive; but because I was suspicious they were hungry I wanted to add a gallon size pail feeder before I closed the hive. While placing the pail over the inner cover opening, I dumped a bunch of the syrup on top of the bees, causing more madness! Yes, my 11th “newbee” mistake! I’m happy to report the following week my Cosmo colony was nice, and quiet. They had eaten almost the entire gallon of syrup! I was amazed by the difference in their behavior. Lesson learned, fed bees are happy bees! They also had some burr comb built up that I cleaned off because the top and bottom supers were almost stuck together. Burr comb is a result of a bee space violation. I need to figure out why it’s happening in this colony. My best guess, is the frames that came with the nuc are not a good fit for my super. At some point, I should probably swap out frames, but I need to read up on how to do that first. In the meantime, I’ll just keep removing it as needed, here’s pictures of me cleaning it off. It’s a bit tedious to remove because I need to be careful not to smash bees! 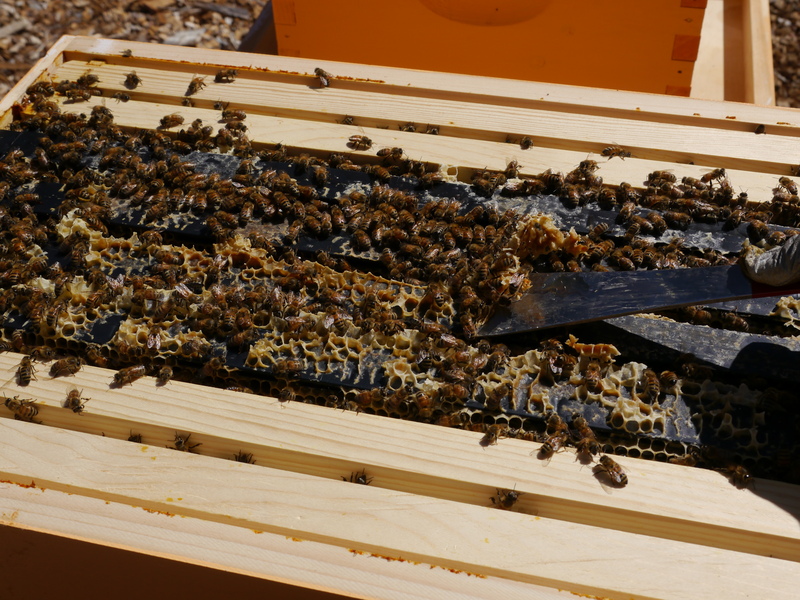 More burr comb on the plastic nuc frames. Each of my colonies needs to make roughly 40 pounds of honey to make it through winter. I’m using deep supers (boxes) so this means my colonies need to fill both boxes with enough honey and pollen by October. If they aren’t full by then, I may need to feed them during the winter to keep them alive. By next year, I hope there will be enough nectar flow and I many not need to feed them at all. There’s lots of opinions about feeding new colonies and feeding in the winter. 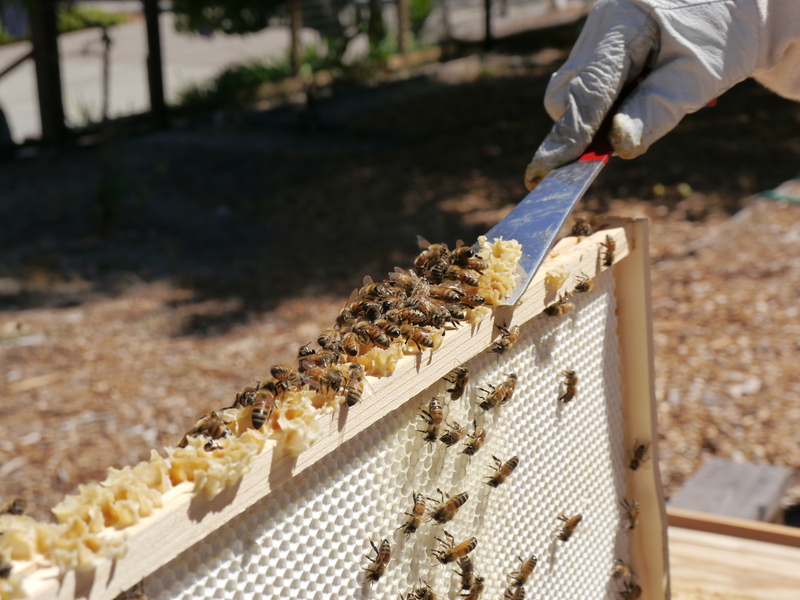 Some opinions are honey bees have been around for millions of years, they know how to naturally survive, and a new colony doesn’t need to be fed. Others think new colonies need help to make it through their first winter, and as a beekeeper it’s your responsibility to help them make it. I found this Mother Earth News article helped me to decide what to do. I lean toward the second opinion, that first year colonies need more TLC. I didn’t get bees to watch them starve and die 🙂 I hope as time goes on my colonies will get stronger, but this first year they need extra special care, and I’d still like to be a beekeeper when spring arrives!